We're pleased to announce a major new feature in GBTimelapse called Aperture Ramping. This feature is for more advanced users, and yields stunning results. If you already own GBTimelapse, just download and install this new release. If you don't own it yet, please download and run the free trial. The best way totally eliminate time-lapse flicker is to use a manual lens. That’s right, forget the automatic Canon EF lenses and use a manual focus and manual iris “cine” lens with an iris ring gear. Then as the light changes, GBTimelapse can smoothly ramp the aperture using a stepper motor to drive the iris ring gear. The first three clips in this demo video were shot this way - bulb ramping PLUS aperture ramping. A Zeiss Distagon T* 2.8/15 with the Duclos Lens Cine-Mod was used for the first three sunset clips. Here are two possible lens choices. 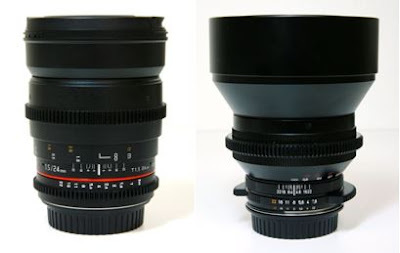 On the left is a Rokinon/Samyang 24mm cine lens and on the right is a much higher quality Zeiss Distagon T* 2.8/15 . Both lenses are “de-clicked” and have iris ring gears. The Zeiss/Duclos is actually a Nikon lens with Canon mount. You can use just about any stepper with an industry standard 32 pitch (0.8 mod) drive gear. One choice is to use a Berkey focus motor with a rail mount and worm gear reducer. GBTimelapse is designed to send aperture stepper commands to an Arduino based device. The first such compatible device is the eMotimo TB3 (both orange and black models). At left is a stepper mounted on a 15-mm rail attached to an eMotimo TB3. The aperture stepper wiring connects to the eMotimo “aux step motor”. Here’s a close up showing the stepper drive gear engaged with a Rokinon lens on a 5D Mk II. The setup is completed by connecting the camera shutter and PC/flash to the eMotimo camera and “i/o port” connectors. Two USB cables connect the camera and eMotimo to the computer running GBTimelapse. Would you mind sharing your complete parts list on your setup? The parts are listed in the GBTimelapse User's Guide, but I'm working on a new blog post that will list a set of less expensive parts. I hope to have the list ready in a couple of days. Is there a way to get the aperture ramping control via the stepper motor without motion control of the emotimo? For my application motion is not a factor but i'd love to be able to control the aperture.